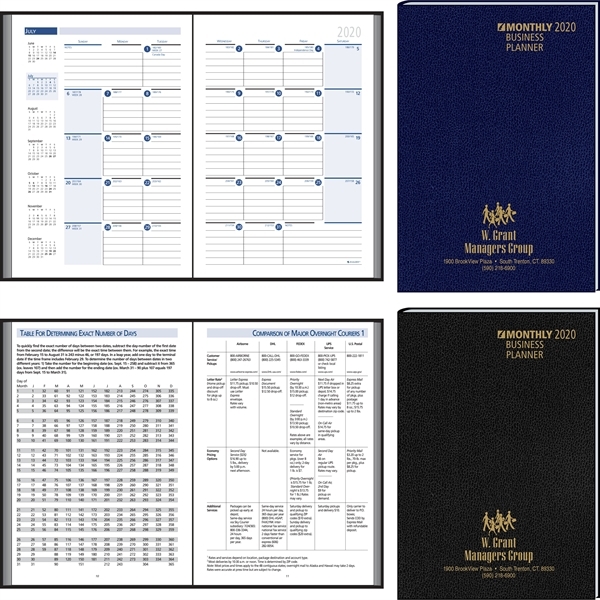 Product Option: Early Order Discounted Price (thru 7/31) - Keep all your business plans, appointments and strategy under control with this useful planner. This 7" x 9 7/8" desk planner is made in the USA with recycled paper from 30% post-consumer materials and sports a durable Morocco leatherette cover. Inside you'll discover 48-pages covering for 14-momths (Jan.-Dec.) of planning with seven-month calendar blocks per spread with screened weekends, and plenty of room for notations, meetings and appointment reminders. It also features a three-year advance calendar, area code listings, and travel and financial reference information. Add your organizational or business name, design or message through our foil-stamping process to create a promotion that your customers and supporters will be certain to use. Size: 7 " x 9 7/8 "